Bynum, who is the only black representative in the Oregon state House, was canvassing in her district ahead of Independence Day, as NPR's Tanya Ballard Brown reported. The lawmaker said she was typing notes in a driveway when a deputy from the Clackamas County Sheriff's Office approached her. Bynum said her mind went from disbelief to "what did I do?" The deputy approached her and guessed that she was selling something, according to Bynum. She introduced herself as a state representative, and to her surprise, Bynum said, he did not demand proof of identification. "It was so incredible for me because he believed me," she said of the officer. "He was well within his rights to go as far down as he could to humiliate me in that circumstance as he wanted to, and he didn't," Bynum said. While the situation did not escalate — she said on Facebook that the deputy "responded professionally" — Bynum points to a history of interactions between police and African-Americans that have not ended as peacefully. "I think if you have the luxury of never having to live in fear it doesn't mean that much to you to call the authorities on someone," Bynum said. "And so there's no consequence. There's no feedback. You're not forced to see my humanity." The incident came amid a spate of recent incidents in which police were called on to investigate African-Americans in the middle of everyday activities. In April, for example, two men were arrested while waiting for an associate at a Starbucks in Philadelphia. In May, a graduate student at Yale who was napping in her dormitory's common room had a police encounter after a white graduate student called authorities. And on Independence Day, there were at least two separate incidents at pools. In North Carolina, police were called after a man demanded that a black woman show her identification to use a private community pool. In Tennessee, an apartment manager called police because a black man was wearing socks in the pool. Bynum said she thinks incidents like these can be "bravado on some people's part to call the police." "I don't know if it's out of fear or power." But the course to changing that won't necessarily lie with changing the law, Bynum said. "I think it's more of a policy, it's more of a mind shift than any law could ever mandate." Bynum pointed to training police "to make sure that the person who's been accused and hasn't done anything feels whole after the incident." "You've created a victim," she said of such police encounters, "but then there's no justice for that victim." The deputy in Bynum's case used his cellphone to call the constituent after the lawmaker said she would like to speak with the person. According to Bynum, the caller, a woman, apologized but was not interested in meeting with her. We've been hearing these stories for a while now of black people being challenged and even arrested for doing ordinary things like waiting for a friend at Starbucks. But, over the past couple of weeks, there have been even more episodes to add to the list of white people calling the police to challenge black people, including children, for doing things like selling cold water, cutting a neighbor's grass, using their own neighborhood pool, and now, campaigning for office. 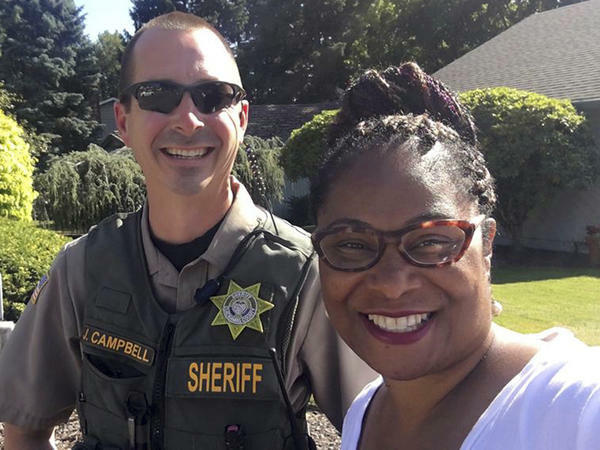 Oregon State Representative Janelle Bynum - who is, by the way, the only black member of the Oregon House - was canvassing in her district outside of Portland on Tuesday when she was approached by a sheriff's deputy. It turns out a resident of the neighborhood had called the police because she decided representative Bynum's door knocking was suspicious. We're talking with Representative Bynum, and she's with us now at Oregon Public Radio. Representative, thanks so much for talking with us. JANELLE BYNUM: Thank you for having me. MARTIN: So this isn't your first campaign, right? So presumably, you've knocked on doors before. What was your reaction when you saw the sheriff's deputy approach? What was going through your mind? BYNUM: (Laughter) Disbelief, I think, is probably the first feeling that I had - and a little upset that the person didn't come talk to me. I think that's the main feeling I had because, you know, I had been out there for a good hour and a half, and anybody that wanted to come talk to me could have come and talked to me. I mean, Oregon is a very friendly place. And so I was just kind of baffled as to why I didn't look approachable. MARTIN: What was the encounter with the officer like? BYNUM: He was very pleasant. He was pleasant in an Oregon way, so to speak. He got out of the car, and he said, let me guess - you're probably selling something, right? So I introduce myself as the state representative. I think it was so incredible for me because he believed me. MARTIN: Really? Why? Why was that incredible? BYNUM: You know, there's this expectation, I think, when you tell an officer something that they will demand some proof - some ID, some something. I had my campaign flyers with me, and so, you know, maybe he saw that. But, you know, he was well within his rights - I think - to ask me to sit down on the sidewalk with my hands behind my back like I see on TV. He was well within his rights to go as far down as he could to humiliate me in that circumstance, and he didn't. MARTIN: And, of course, I'm going to ask, do you think race was a factor in this person's decision to call the police rather than approach you directly? We know that you're African-American. I don't know what the race of the person who called was, but the - or is, rather - but The New York Times just looked up that zip code, and they say that the census indicates that it's a - it is not a terribly diverse, you know, area. MARTIN: So do you think that race played a part in this encounter? BYNUM: It certainly played a part in how I reacted. And one of the things that I've learned in canvassing is that I don't fill in the blanks for my constituents in what they think and how they feel. That's kind of the point of canvassing, is for them to tell you, you know, what goes into their decisions. So the caller told me that she was concerned about the safety of the neighborhood. What went into that decision that she made - I don't know. MARTIN: So you were able to speak to her - the person who called. BYNUM: Well, first, let me back up a little bit. I asked the officer. I said, can you take me to that house, so I can talk to this person? And I made that request as a part of establishing or re-establishing some dignity in the situation. I had been accused of looking suspicious, and I felt like the caller needed to see my face, and she needed to look into my eyes, and she needed to hear me say I was actually here on her behalf. So he went to his car and came back with his cellphone, and the caller was on the line. MARTIN: What did she say? BYNUM: She apologized. I accepted. I offered to go by her house and, like, leave a note or, you know, just try to make amends - again, just to have that human interaction, which I think we need so much of, especially when there are incidents where people feel suspicious about something. Because you never get that opportunity to go back and have person A tell person B, this is why I thought you were suspicious - and, you know, person B saying, well, I was doing this, and it's normal to me. And that's how we can be, I think, better neighbors. MARTIN: But she wasn't willing to meet with you. MARTIN: Well, before we let you go, you are a state representative, and - which means you get to participate in shaping policy and law. And I'm wondering if there's a remedy that you see to this? BYNUM: Well, some people have asked me if legislation is the answer. And I say, you can't legislate humanity. I think if police department procedures included an opportunity for dialogue between people when we have these instances, when officers are trained to make sure that the person who's been accused and hasn't done anything feels whole after the incident because you've created a victim, right? And so I think it's more of a mind shift than any law could ever mandate. MARTIN: Well, that was Oregon State Representative Janelle Bynum. She's a Democrat who represents parts of Portland and its eastern suburbs. She's running for her second term in the state House. Representative Bynum, thanks so much for talking with us. BYNUM: Thank you. Transcript provided by NPR, Copyright NPR.